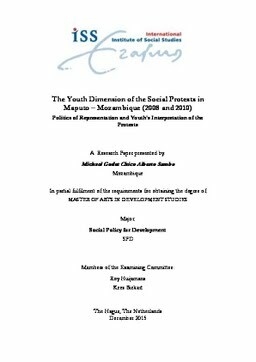 This research explores the Maputo protests of 2008 and 2010 in the perspective of youth involvement. Given the fact that these events were most significant social protests observed in the last two decades in Mozambique and massively participated by youth, this research seeks to unravel the youth dimension of those protest. Since the events got wide media coverage, however, the media did not represent the voices of the youth. Thus, the author analysis two newspaper, Jornal Noticias and Jornal OPais, of major circulation in Mozambique, using the media analysis tools such as focalisation, categorization and framing in a total of 120 articles related to those events. Moreover, using an ethnographic orientation, he does site visits and qualitative interviews with participants and some organizer of the protests. The research concludes that the media representation profiled the participants as a socio-economically homogeneous group of people, mostly youth, poor and vulnerable. These youth are neglected on both media outlets and represented as criminals through membership categorisation, therefore, discredited. The media focalization were mainly on privileged politicians and opinion makers as well as the journalists, and the events were negatively framed resulting youth participants future dissociation from that event. On the contrary, interviews revealed that the participants were diverse subgroups of youth willing to express their different compelling grievances through violent protests as their only mechanism to be heard and responded.